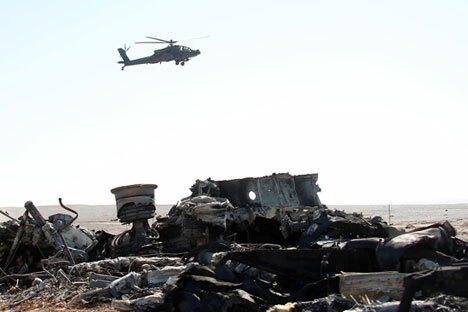 Wreckage of Russian Airbus A321 at the site of the crash in Sinai, Egypt. The Kogalymavia plane crash in Egypt on Oct. 31 has triggered a broad public response. Ninety-seven percent of respondents polled by the Russian Public Opinion Study Center (VTsIOM) are aware of it. Knowledgeable respondents differed in their opinions on the causes of the crash: 43 percent are prone to believe in the terror attack theory, and 35 percent suggest a technical failure. Only 3 percent argued it could be pilot error. Sixteen percent of 1,600 respondents polled in 130 populated localities in 46 regions on November 7-8 found it difficult to answer the question. There is no unanimity about possible consequences of the plane crash for Russia. Forty-seven percent said nothing would change in the country's life and 41 percent expected consequences, with even 'very serious ones' being suggested by 25 percent of respondents. Those who think things will change mentioned stricter checks and control of air carriers and airports (15 percent ) and negative implications, such as a ban on flights, first of all to Egypt (9 percent ), worsening relations with other countries (6 percent), an outflow of tours and tourism industry problems (5 percent ) etc. Seven percent fear possible terror attacks. An overwhelming majority is expecting certain actions from Russian authorities. Over half (57 percent ) think that authorities should improve aviation safety and about a third (32 percent ) call for the stepping up of anti-terrorism measures. Another 28 percent call for the suspension of flights of Russian planes above war zones. Nine percent choose Russia's withdrawal from the war in Syria, and 2 percent say nothing should be done. The poll was held in the first days after the plane crash, VTsIOM communications director Alexei Firsov said. "The terror attack theory did not prevail on the information space back then yet respondents were already inclined to prioritize it. We can definitely forecast an increase in this percentage in the upcoming days. On the whole, society that has historical memory of terrorism is inclined to link such catastrophes to this factor at the level of initial reaction," he said. Kogalymavia's A321 en route from Sharm el-Sheikh, Egypt, to St. Petersburg crashed during the 24th minute of its flight on October 31 in the north of the Sinai Peninsula. All 224 people onboard died in the crash. The plane was carrying citizens of Russia, Ukraine and Belarus.